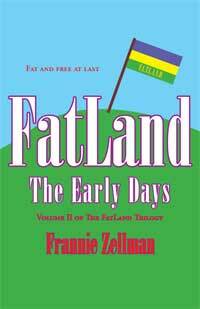 In the fantasy/science fiction adventure FatLand (Volume I of The FatLand Trilogy), the weight-oriented Pro-Health Laws of the US have become so oppressive that people seeking freedom over their bodies have established a new country where life is good and scales are forbidden. FatLand: The Early Days is both a sequel and a prequel, revealing a hidden history as three archivists set out to discover how FatLand began—and quickly become aware that someone doesn't want them to know. "Zellman['s writing style] is an intriguing mix of sensualist and minimalist. they’re so lush, readers can almost smell or taste them." 400,000-people strong. In FatLand, discrimination is illegal. Lots of us would line up to become citizens." and erotica. I recommend it to anyone and everyone with enthusiasm."